WayRay is on the cutting edge of head-up displays with their holographic projections that are bigger and clearer than we’re used to today and unaffected by things like polarized sunglasses. That’s just the beginning, though. WayRay’s latest work incorporates augmented reality into its displays to keep the driver’s eyes up while providing them with critical information. The prototype, installed on a Genesis G80, projects 3-D images onto the road ahead like arrows that seem to go up the street and around the corner you’re meant to turn on and markers showing the locations of gas stations you can’t see behind buildings. Although the tech making its way to cars soon creates a display only marginally larger than the biggest on the market today, WayRay says it’s close to a system that can use the entire windshield as a see-through augmented reality screen. To keep a driver from getting distracted by too much information, an eye tracking system would monitor where the driver is looking and only display information there. Like some infotainment screens, WayRay’s technology also has the ability to show the driver and passenger different images, so while the passenger may see a windshield full of information, the driver will only see important driving information, at least until cars become autonomous. Even cooler is what’s coming next: side window projectors. WayRay says its working to shrink its technology enough to fit in the top of the door card, projecting augmented reality holograms up onto the side windows. Like the windshield tech, the driver would be limited in what they see, but passengers could see a wealth of information about the world around them. WayRay is even working on ways to retrofit the technology to older vehicles, ideally the rear side windows of taxi cabs and the like where passengers could learn about the city around them as they go. WayRay says the side window technology is just three years away and the windshield technology could be even closer, but when you see it in a production vehicle depends on the automakers. So far, WayRay is officially working with Honda, Hyundai, and Porsche, but other automakers are unofficially looking into the tech, as well. Valeo is working on see-through technology, too, but to a different end. Pickup trucks from the big three players, Chevrolet, Ford, and Ram, all offer trailering packages with the ability to install a rearview camera on the back of your trailer so you can still see behind you. It’s handy, but the perspective is off what with the camera being way behind the back of the truck. Valeo’s “Invisible Trailer” software uses input from the truck’s 360-degree camera system to figure out what the perspective ought to be and blend the trailer camera with the truck’s rearview camera. As a result, the trailer is simply edited out of the image, allowing you to see “through” it without your brain having to compensate for the change in perspective. ConnectedTravel has partnered with Honda to bring more of your smartphone functions into the dash and reduce distractions while not impinging on your totally connected life. Through the Honda app, you’ll be able to work simplified versions of the apps you use the most. For example, most people tend to order the same thing every time at their favorite restaurant, so by linking your GrubHub account you can easily place an order for your usual and pay with a saved credit card. Likewise, if you pull into a gas station with smart pumps, you can select your pump and pay from the infotainment system without ever going for your wallet. If you’re in the mood for something new, the system will help you find a restaurant, give you directions, and help find parking when you get there. The same is true if you want to see a movie. 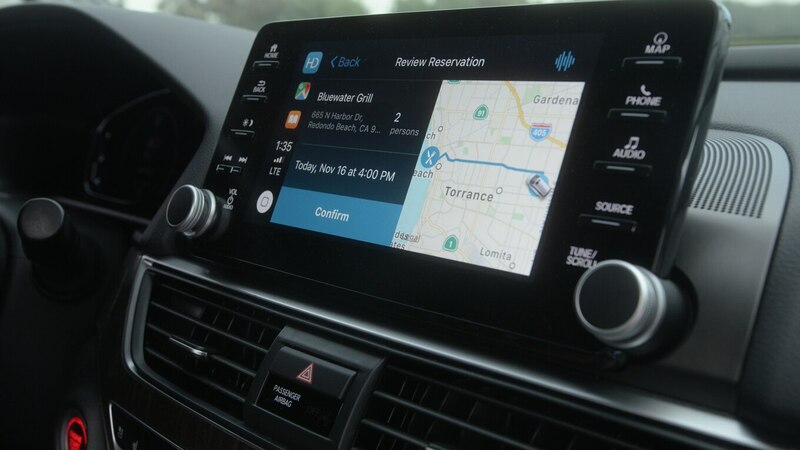 The system works both through the touchscreen and, to reduce driver distraction, through voice commands. The system will learn your preferences and habits as you go so it can be more helpful in the future. Following the in-dash app will be a tablet-based app for the kids in the back seat. A series of simple games are loosely connected to what the car is doing—i.e. if the car is moving forward, your character moves forward, but if the car stops, the character stops. By completing tasks in the games, users earn points that can be redeemed in a marketplace for things such as gift cards and discounts at major retailers. The points and the rewards are free monetarily, but the retailers are betting your anonymized data and brand loyalty will be worth more in the long run. The tablet also interacts with the vehicle’s infotainment system if the driver allows it, letting the kids change the radio, adjust the rear cabin temperature, and send destinations to the navigation system. Audi has another, less involved idea for making the car part of the entertainment experience, but only when it’s parked. 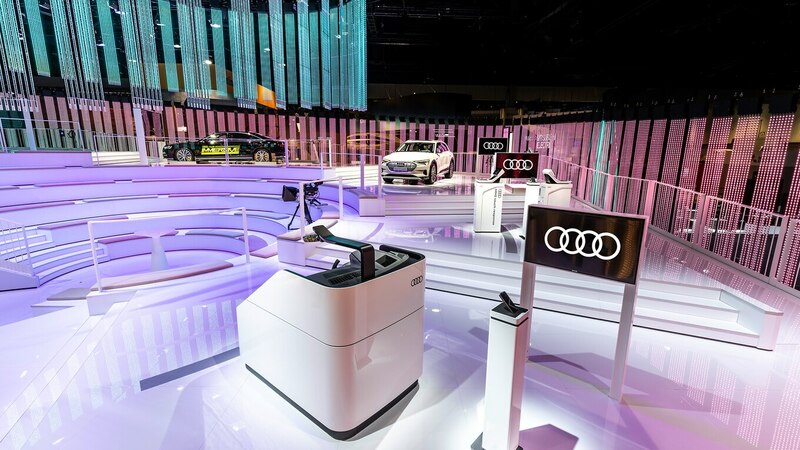 Using a number of systems on an A8, Audi and Marvel designed an experience wherein the car’s seats, active suspension, ventilation, and lighting systems act in concert with an action movie to enhance the experience. Demonstrated with clips from Avengers: Age of Ultron, the car’s active suspension jostled passengers around as cars on screen raced and crashed while the seats vibrated with explosions and air vents blasted. The lights change with the mood of the scene, and the cabin temperature varies, too. The only additional equipment needed, Audi says, are vibrating motors in the seats and a dedicated computer to control and coordinate the vehicle’s responses to the movie. For the demo, the movie played on a big screen in front of the car as well as on the infotainment screen and rear seat entertainment screens, but Audi says future iterations could use tablets or VR headsets. There’s no production timeline yet for the tech. Intel had a similar idea as Audi, but without the headsets. Instead, it removed the second-row seats from a new BMW X5 and put a pop-up big-screen TV right behind the front-row seats. You sit in the third row and enjoy interactive media en route to your destination both on the big screen and projected on the windows. In theory, the vehicle is autonomous. You summon it with your phone, and the vehicle pulls up, recognizes your phone, unlocks the door, and welcomes you with a message projected on the window. You climb in, and a digital assistant verifies your destination and shows you the route and the time needed to get there, and off you go. Once you’re moving, the fun begins. The screen rises, and projectors mounted in the headliner extend the image to the side windows for a 180-degree experience. 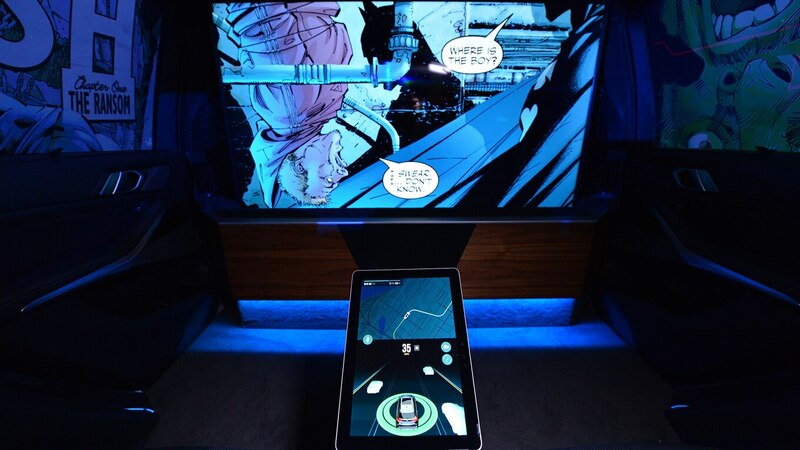 For this demo, Intel partnered with DC Comics for a Batman theme. The vehicle is branded with Wayne Enterprises logos, and your digital assistant is none other than Alfred Pennyworth, the butler. As you’re cruising along, comic book-style images of Gotham City streets are projected on the side windows so you can’t see the safe, boring city you’re actually commuting in. 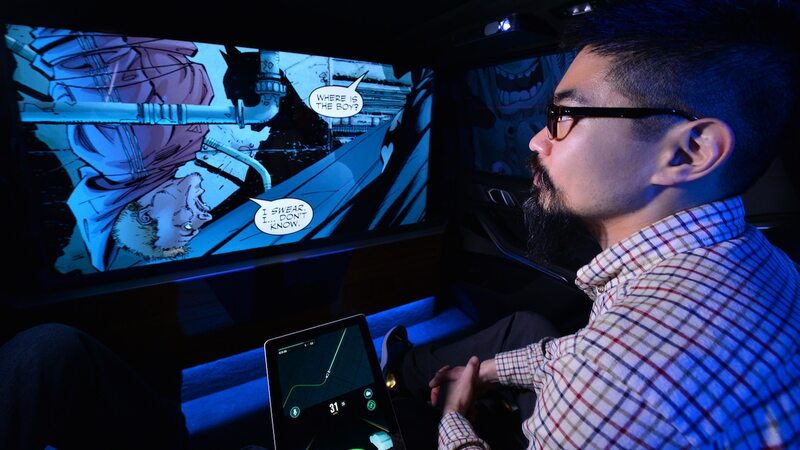 To keep you entertained, DC and Intel designed a custom digital comic book reader that projects panels from a Batman comic on the screen and allows you to flip through it with BMW‘s gesture controls while coordinated music plays. If you’re not interested in reading, the system also displays movies using both the screen and the windows. You can also watch movie previews and buy movie tickets through Alfred. Along the way, a tablet between the seats displays your position on a map, your route, your ETA, and an illustration of all the vehicles and objects around you the autonomous car is watching as it drives. You can also bring up the vehicle’s exterior cameras if you want to see what’s going on out there. As you approach your destination, warnings pop up so you know not to start a new video. When you arrive, the screen lowers, and both it and the door windows bid you farewell. Intel’s demo is purely a concept at this point, but the company thinks there’s lots of potential for this kind of in-car entertainment once autonomous vehicles become a reality, and it’s not alone in watching that trend.